Good morning Clay and people! Hiya, Mr. Pigeon and the Claymation crowd. Good Morning Clay, I love you! good morning Clay!! so glad you're here this morning! Clay's on today and tomorrow, then on Wed and Thursday it's Glen Jones and then on Friday it;s Matt Warwick. Good Ttransition between Sneaks and UFO. i saw UFO, I think they opened for rush, ? 1977 at the armadillo in austin texas. is this the shortlist already Ken? Yes, this is the shortlist. S.A.M. is the robot Fabio. He pretends he's indifferent to Clay, but his circuits light-up when Clay enters the room. It shall be Clay Pigeon, Glen Jones and Matt Warwick for the next 6 weeks or so, plus the occasional fill-in. i am always up at 4 am. ! Can we hear 'Jimmy Carter Says 'Yes' by Gene Marshall today? This is my single favorite Aerosmith song, how did you know! Was that a different version than the one on the first LP? heLLO hELLO! Glad you are here! investigate the old band he was with, Ruth's Refrigerator. very great stuff. 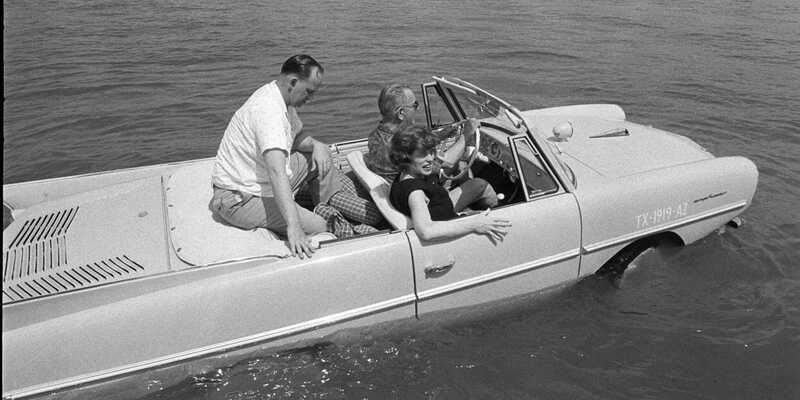 I saw one of those amphicars in the Raritan River when I was a kid. Wow! "Several attempts were made using Turtle to affix explosives to the undersides of British warships in New York Harbor in 1776." LOVED steakkums! morning clay - happy birthday again ken. do you have president's corner or presidential minute for us clay? president's day replaced washingtons and lincolns birthdays i think. Clay owns the morning slot. He is Maron-esque in scope. Submarine's appropriate for a ♓Pisces. M.C. Underwater FoundingFather. - Guten TZAG ~ GoodMorning President'sDay ♓Piscean Pigeon & Joyeux Solar Return (B-Day) to Thee - early for once. Hi. We have the Legislative Branch - Congress - to make Laws. The Executive Branch is for Leadership - otherwise, why have a damned POTUS @ all? Of course - Money is Gawd - esp. in the U.S. & the rest is pantomime...Lincoln was born same day as Darwin! : February 12, 1809. Height-wise, the shortest president was James Madison (5'4") and the tallest was Abraham Lincoln (6'4"). Which President had the smallest hands? you could bake-umm steakumm, but pan fried was always how i had it. would make a good beef on weck. "Journalist Alexander McClure later wrote, "No man ever entered the Presidency so profoundly and widely distrusted as Chester Alan Arthur, and no one ever retired ... more generally respected, alike by political friend and foe." somewhere i have a robo letter from jimmy carter. i drew a picture of him in high school and sent it to him (i was in high school, not him). you're allowed to put alice cooper in the 'C's' if you want. Which president is severely mentally ill? He was also in the presence of LBJ that day, and I think he had dinner at Reagan's White House, so has been in the presence of at least three presidents. Came out for Bernie last year. President with the smallest hands is the same one with the biggest demented ego. Clay should have this slot! Hands down victor! Latvian women are the tallest. BenFranklin, Churchill, & J.Edgar Hoover. Best President in a dress. someday they'll change the name to x ray new jersey. Hey Clay! Great Cramps cut! Buick Wildcat 445. Catch me if you can. Baking bacon is the way to go. Happy Presidents Day Jimmy Carter! Allan Sherman, Pop Hates the Beatles? Alternative Facts! FAKE NEWS! SAD! wonder how many deejays put this on in the day to take a smoke break. Had no idea Emitt Rhodes finally released new material last year. I think hearing some of his recent interviews turned me off a little. Kurt Cobain would have been 50 today. mitch mcconnell is 280? no wonder his face is so puckered like an apple doll. yea Clay in the AM! Iggy Pop "Play It Save" (from "Soldier"). Wouldn't it an appropriate song for today? -2C (~ 34 F) and snowing on the Atlantic Coast of Nova Scotia. ah, -2 C is more like 28 F.
Never heard Robin Trower on the "classic rock" radio station... weird. i replaced the igniter in our oven 3 times. we wake and bake in the as seen on tv nu-wave oven now. Morning Clay! Almost forgot it was your day! no cliff - it's THAT GUY! Yep, *this* guy has probably already out-Nixoned Nixon. Lance Rentzel !! very good..
remember her on that serta mattress? Whoa, this one is new to me. Even after what happened to SAM he didn't put on any Foghat. Consummate professional. carlyle - i'll wager trump is a very flatulent man. @dale it's what his name means here in England. And he's a huge fan of Putin too. I'm just going to call him "President Poot" from now on. President & General William Henry Harrison (“Tippecanoe and Tyler Too”) lasted 31 days in office before getting felled by pneumonia. The old general, who at 68 was the oldest US President prior to Ronald Reagan, to prove he wasn’t infirm, gave the longest inaugural address in US history (2 hours) in the midst of seriously inclement weather wearing neither hat nor coat. Conan the Destroyer, to be precise. Seeing Roger Moore and Grace Jones in bed together when I was 6 years old was a very...interesting experience. ha ha - "who trumped?" It's national Cheri Pi Day. Where in the hell is she? yeah, she was in live and let die. The singer Rihanna is 29 today. She's from Barbados. ah - roger moore bedded downanouther black woman in live and let die then. he was a very progressive lover. 'Roger' also has another meaning in England! anyone named roger trump is doomed then. 'i'm done' so trusting and garrulous. dale - that would've been James Joyce. Hi all. For the record, I'm enjoying Clay's "nice, not vicious, unsweaty bed" show. And, I refer to him as "President* Trump". Wull - TrickyDick won by landslides (the 'Silent Majority') illegally bombed Cambodia, sicked the Govt. on his Enemies List - took his Constitutional crisis all the way...Drumpf may go down as a fleeting goofball distraction (likely) in comparison - or he may end Life on Earth (which Climate is kinda doing awlready...policies there alone). Hold onto your ticket stubs...The U.S. is blowing it on Climate, Health, Education, Infrastructure, War for Oil, Civil Rights (race, death by police), Oligarchy Economics (Sold Out Government) - you name it. The wheels have obviously come off the Electoral System - as the Oligarchs want them to...Well, happy morning show...point & I did have one...Beep-de-beep. more ken griffin in the morning please. Love the Eclectic mix, Clay! Good Morning Clay and listeners. lot of life happening outside of our little insular worlds. Missing HunterThompson now - that's for sure. Killing it today, Best show I've heard in awhile! Thanks Clay!!! We need YOU to stay with us, Clay. Thanks, Clay, for this morning's show! See you next time. Pisces? What you people can do with 2 fish. @RevRab: HST was one of a kind, sui generis. Be glad we had him when we did. Pakistan rounded up Osama bin Laden with the Saudis paying with tankers of oil to keep him imprisoned him in that compound. Obama's phony killing sitting duck bin Laden was a pretense. Yeah - U.S. foreign policy has been all about PetroDollars for decades. Nice job keeping the balls in the air Clay! Appreciate the good webio.